Workplace Burnout is Not Your Fault ~ Primed for Possibilities with Felicia B. Lately I’ve been speaking a lot about burnout. I’ve talked about the signs and symptoms of burnout, how perfectionism leads to burnout, and how culture contributes to burnout. I’ve also shared strategies to help you claim sovereignty over your life, both personally and professionally. 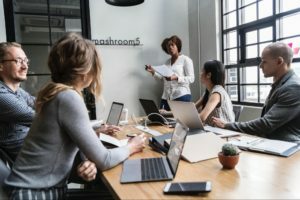 I also recently attended a HR leadership summit where the effects of culture on burnout were discussed, particularly the ways that workplaces themselves create conditions that lead to burnout. Fortunately, I’m glad to say that there were many leading HR professionals present educating and encouraging others on the value of creating better workplaces. The message was clearly this: creating more humane, values-driven workplaces that allow and encourage employees to engage fully with their work is beneficial in more ways than just higher productivity and profits. Smart employers know that supporting employees to realize their full potential and creating conditions which allow people to find meaning in their work makes employees more engaged and productive. More and more, this is becoming the way business is done. The old systems that relied on merely extracting energy and knowledge for profit are dying away. The problem is that change is slow in coming to many workplaces, as seen in the research that shows engagement (and thus productivity) are down. Research supports the idea that workplaces need to take a more holistic approach to engaging employees, not just using band-aid solutions like installing a foosball table or allowing employees to wear jeans on Fridays during the summer months. There exists a huge gap between knowledge and action. Along with bottom lines, this is bad news for employee well-being. At the HR summit I mentioned, enthusiasm was high when this topic was discussed. Still, I could sense an energy of helplessness in the room. This can be extremely frustrating and leave you feeling powerless. I understand. I felt that way too during my time in corporate. That’s why I want to share my observations with you; because I want you to know that if you’ve hit a wall, if you’re feeling powerless and helpless, if you’re burning out – it’s not your fault, and you’re not alone. I believe the coaching world (and psychology/psychiatry) places too much emphasis on individual people solving problems that are bigger than they are. When you don’t solve the problem, you feel like it’s your fault, that you’re too much of one thing or not enough of another, or that you just don’t get how to be happy with things as they are. And when you feel it’s your fault, you feel demoralized and helpless. You resign yourself to living unhappily with the way things are. Or, perhaps you keep trying one self-help method after another before realizing they simply don’t work for you. Either way, you believe that nothing can change, and this can really put a damper on your work life. But I’m here to tell you that change can happen, and it does happen. But change does take time and effort, and effort requires energy – energy you won’t have if you’re burned out. You have to deal with your burnout if you want to make changes for the better. So what can you do? There are individual solutions to YOUR burnout that can help you to feel more energized and empowered so that you can create positive change in your life. YOU CAN liberate yourself from the sense of powerlessness that comes from dealing with a system that is not kind to your needs. As you feel more energized, you can empower others to wake up and see what’s going on, and inspire them to make changes. I see this as a ripple effect that empowers more and more people to free themselves from the grip of burnout. This can create changes that are long overdue in the workplace, in society, and in their own lives. If you need solutions for understanding how to manage your burnout and make work a better place to be, contact me and let’s talk about it. I can help you take back your workday.